Carbon Farming Works. Can It Scale up in Time to Make a Difference? The knowledge and tools to sequester carbon on farmland have blossomed rapidly in California; now farmers and ranchers just need funding to make it happen. Lani Estill is serious about wool. And not just in a knitting-people-sweaters kind of way. 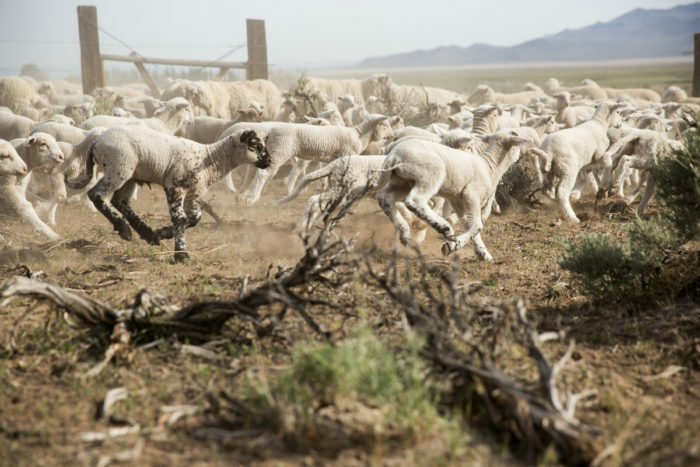 Estill and her husband John own thousands of sweeping acres in the northwest corner of California, where they graze cattle and Rambouillet sheep, a cousin of the Merino with exceptionally soft, elastic wool. Wool, an often-overlooked agricultural commodity, has also opened a number of unexpected doors for Bare Ranch, the land Estill and her family call home. In fact, their small yarn and wool business has allowed Lani and John to begin “carbon farming,” or considering how and where their land can pull more carbon from the atmosphere and put it into the soil in an effort to mitigate climate change. And in a rural part of the state where talk of climate change can cause many a raised eyebrow, such a shift is pretty remarkable. Over the last two years, the Estills have started checking off items from a long list of potential changes recommended in a thorough carbon plan they created in 2016 with the help of the Fibershed project and Jeffrey Creque, founder of the Carbon Cycle Institute (CCI). 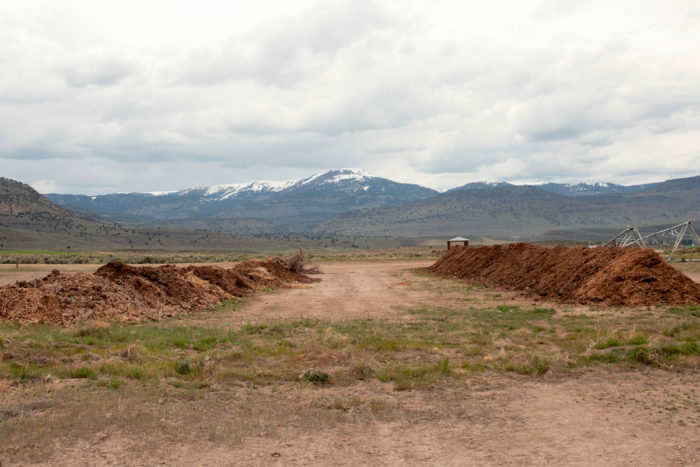 The plan lists steps the ranchers can take to create carbon sinks on their property. And in the first two years, they’ve gotten started by making their own compost out of manure and woodchips and spreading it in several strategic places around the land. They’ve also planted more vegetation in the areas of the ranch that border on streams and creeks to help them absorb carbon more efficiently, and this year they’ll be putting in a 4,000-foot row of trees that will act as a windbreak, as well as a number of new trees in the pastured area, applying a practice called silvopasture. All these practices have allowed the Estills to market their wool as “Climate Beneficial,” which is a game-changer for them. They’ve also sold wool to The North Face, which used it to developed the Cali Wool Beanie—a product the company prominently touts as climate-friendly. The company, which has marketed several other regional products as part of their ongoing collaboration with Fibershed, also gave the Estills a one-time $10,000 grant in 2016 that the ranchers combined with some state and federal funding to help them start enacting parts of their carbon plan. Like the Estills, the owners of dozens of farms, vineyards, and ranches in 26 counties around California have drawn up ambitious carbon plans that take into account the unique properties of each operation and lay out the best, most feasible ways to absorb CO2 over the long term. In arid ranching counties like Marin, that might mean re-thinking grazing practices, while in Napa Valley it could mean building soil in vineyards by tilling less and planting cover crops, and in San Diego County, it may mean protecting existing citrus and avocado orchards from encroaching development and working with farmers to plant more orchards. It’s early days for the effort, but in a state that plans to reduce greenhouse gas emissions by 40 percent below 1990 levels by 2030—the most ambitious target in North America—these plans are laying out a solid plan to help farming and ranching become heavy hitters in the fight against climate change. They’re also helping create a model that is being watched closely by lawmakers in states like Colorado and Montana, where other carbon farming projects are coming together. Agriculture accounts for around 8 percent of California’s greenhouse gas (GHG) emissions, but that number doesn’t quite reflect the impact of the gases themselves. Croplands in the state are the primary contributor of nitrous oxide, the most potent GHG, and account for 50 percent of the N2O that ends up in the atmosphere. While the bulk of the state’s methane emissions—25 times more damaging to the atmosphere than carbon dioxide—also originate on animal farms. On a global level, food production accounts for between 19 and 29 percent of climate-warming GHG emissions. It’s not surprising then, that some farmers are eager to be part of a solution. But as the rubber hits the road in California, the big question is how farmers will fund these changes. While solutions like the ones the Estills are tapping into, which combine consumer interest with public funding, seem promising, there’s still a long way to go before the efforts scale up in earnest around the state. The momentum may be growing, however: The Marin Carbon Project, which pioneered carbon farming in California, recently had its day in the sun with a New York Times Magazine feature. And success stories like that of the Estills may soon bring more food producers on board. For Lani Estill, everything began to change in 2014, when she developed a small yarn brand. But she was only able to sell a small percentage of the wool directly to consumers, and most of it went to the wholesale market, where it sold for next to nothing. Some years, Estill says, they’d store it to see if they could get a better price the following year. In 2014, Estill met Rebecca Burgess, a persuasive enthusiast of California wool with a vision to reinvigorate the supply chain for regional fiber, yarn, and cloth while building a market for those things simultaneously. Burgess, who had built a statewide network of fiber producers through her Fibershed network, was connected with the Marin Carbon Project and several other nonprofits campaigning hard to make carbon farming a reality. Burgess had also developed the “Backyard Project” with The North Face, which revolved around creating a shirt, and then several sweatshirts, using a transparent, mostly regional supply chain. The beanie made with climate beneficial wool was a natural next step. “We make products so people can go explore and enjoy nature. And addressing climate is obviously an important issue,” says James Rogers, director of sustainability at The North Face. Based on their own internal lifecycle assessments, the company also determined that focusing on the types of materials it uses and how those materials are made offered the most effective way to address its environmental impact. 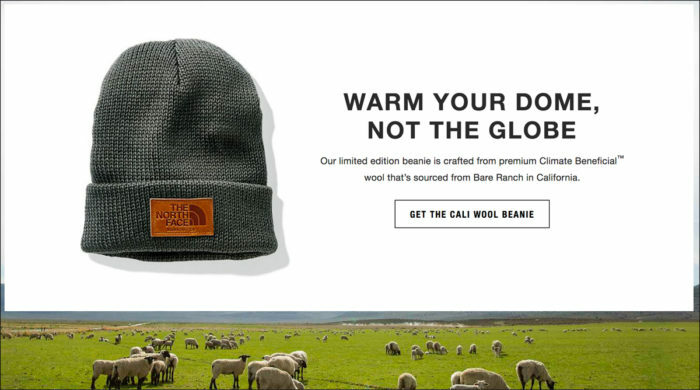 The Cali Wool Beanie was the top-selling beanie on The North Face’s website when it was released last fall, suggesting that some consumers are onboard with supporting carbon farming with their dollars. Lani Estill, who has begun to sell more of her wool at non-commodity prices, agrees. She’s also created a community supported cloth project (a CSA for wool) as a way to invite home crafters and small brands to take part in that call and response. The idea of crafting farm-specific carbon plans grew out of the Marin Carbon Project, a collaborative research effort between landowners John Wick and Peggy Rathmann, scientists at the University of California, and several conservation groups. 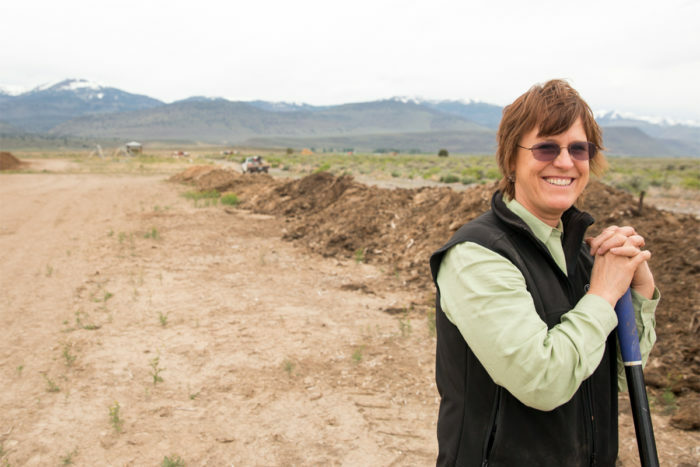 Launched in 2008, the project has spent the last decade looking at the role that applied compost and grazing management practices can play in helping soil absorb more carbon from the atmosphere on the state’s 54 million acres of rangeland. Whendee Silver, a professor of ecosystem ecology at the University of California, Berkeley, managed a team of researchers who compared the CO2 and water retained in a series of plots of land—one where a thin layer of compost was applied, one that was plowed, one where both compost application and plowing took place, and a control plot. 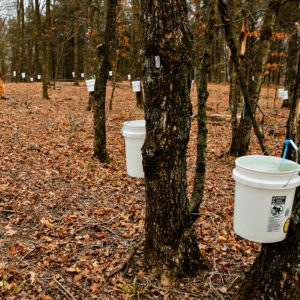 In 2014, the team published the first round of evidence that showed that compost applications and other carbon farming techniques have the potential to help mitigate climate change by building biomass and transferring carbon from the atmosphere back into the soil. The researchers found that a single application of a half-inch layer of compost on grazed rangelands can increase grass and other forage plant production by 40 to 70 percent, help soil hold up to 26,000 liters more water per hectare, and increase soil carbon sequestration by at least 1 ton per hectare per year for 30 years, without re-application. And because the dairy manure the project used to create the compost would have otherwise released methane to the atmosphere, the result was particularly promising for the climate. This year, Wick has returned his focus to his own land, while a handful of nonprofits such as the CCI and the California Climate and Ag Network, as well as county-level resource conservation districts (RCDs), are carrying on the change to scale up the statewide effort. Nancy Scolari, the executive director of the Marin Resource Conservation District, says it has been interesting to see carbon farming go from a fairly abstract concept to an actual set of fundable practices in just a few years. For many farmers, she says, the fact that they can’t actually see carbon in the air or the soil, made the Marin Carbon Project “hard to really appreciate at first.” But when Silver’s research was released, Scolari says it filled in some important gaps in the wider conservation world. And while Estrada admits that the interest so far has mostly come from farmers who are already working outside the agriculture mainstream, in most counties the early adopters, who want to make—and execute on—a carbon plan for their farms still outnumber the local RCDs’ capacity there. Four northern California counties—Napa, Sonoma, Mendocino, and Marin—have all developed templates that can be adapted in other parts of the state with rangelands, vineyards, orchards, and forests. In Marin, 10 farms had completed carbon plans as of the end of 2017, and five more are working on them this year. 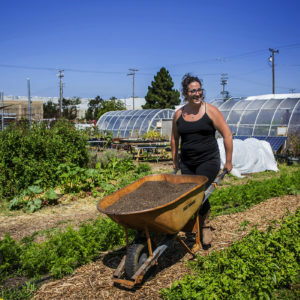 But the Scolari says she only has a few small pots of potential funding—from land trusts, the state’s coastal conservancy, and the U.S. Department of Agriculture’s National Resource Conservation Service—to offer farmers. 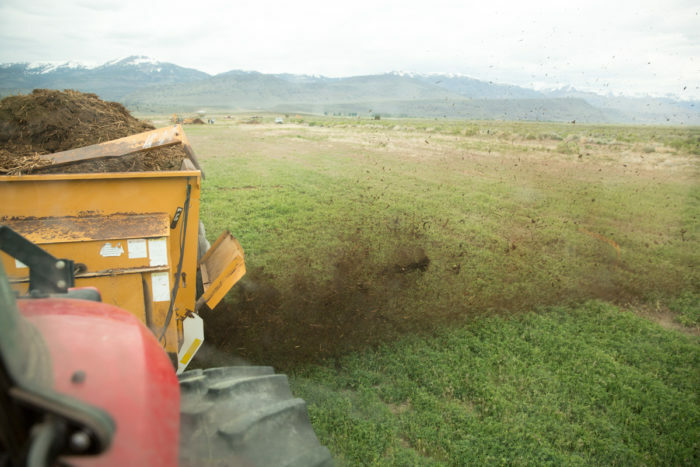 For instance, planning to spread a layer of compost across every acre of your farm may sound relatively simple, but the cost of making it (or buying it), hauling it, and spreading it can add up quickly. And no farm has executed on every item in their carbon plan just yet. “We have producers doing one or two practices, which is really great. But the bottom line budget for [the whole plan] is hundreds of thousands of dollars,” says Estrada. 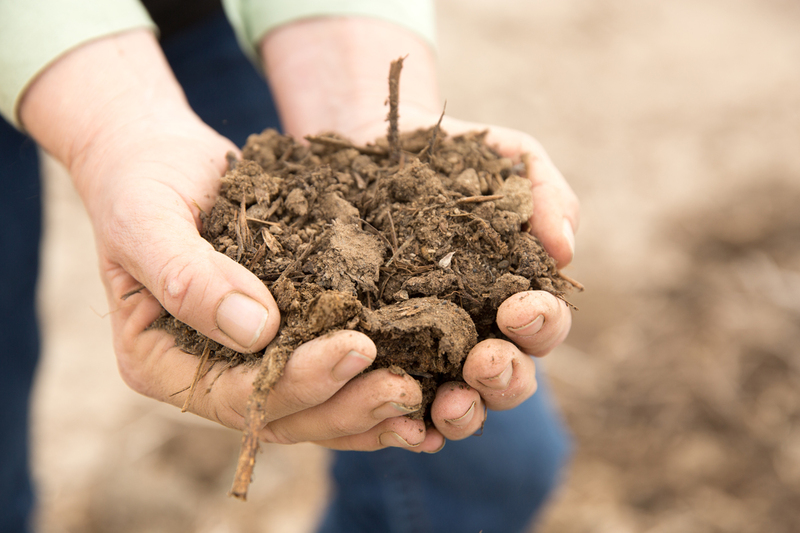 In 2017, the state set aside $7.5 million for the Healthy Soils Program and a larger Healthy Soils Act as part of its cap and trade program. That was a good start, says Estrada, but adds that Marin County alone “could spend that twice over with a full build-out of its plan.” And there are no funds allocated for healthy soils in the state’s current fiscal year budget. Larger structural investments are also helping paving the way. Fifty million dollars from the cap and trade pool have also been made available to large dairy farms that compost their waste, at which point it can be made available to farms and ranches. And the state’s recycling agency has also set aside $72 million for new compost facilities. When farmers are able to raise the funds to enact their carbon plans, they’re likely to see a return on their investment over the long term. “If we can increase organic matter in soils, we thereby increased water-holding capacity,” points out Scolari. And in drought-prone California, that alone has enormous value. As John Wick sees it, money can definitely help kick-start the process of sequestering carbon on farms, but so can time. Calla Rose Ostrander, a consultant who works with Wick as well as the People, Food and Land Foundation, acknowledges that the funding so far has been relatively small, but considering the scope of the work to be done, she believes the inflection point isn’t far off. Met Wes Jackson in KS several years ago and have followed him since. 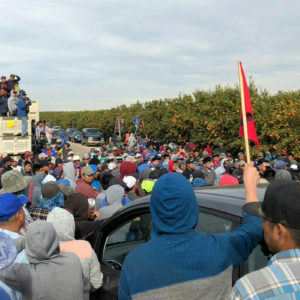 Is the CA effort coordinated at all with that of The Land Institute? Can the two practices merge on one farm? Would like to contribute, in case any of your cited groups need research or writing volunteers. Thanks for the excellent article. The thing takes shape! Re your Big Question "can it scale in time?" If you believe Tony Seba of Stanford, the prospects actually look pretty good. He says AEVs will reduce transport emissions (now the largest component) by 90% by 2030. Add your important point about the need to reduce existing atmospheric levels, and carbon farming could be a perfect adjunct. Love Tony on tech and projections, but keep a questioning eye on him when it comes to "disrupting agriculture"... I'm afraid he's too enamored with technological solutions and wants to "disrupt the cow" (his words), probably with synthetic meat. Likely he's 100% urbanite, who couldn't tell or even explain the difference between dirt and soil. Hope I'm wrong! How certain are we that using dairy manure to make compost (with straw and crop residues presumably) reduces the amount of methane produced? I am a huge fan of everything mentioned in this article and believe Livestock has a very important role to play in Sustainable Agriculture. However it is getting a bad press from some quarters so I believe we have to be certain of our facts. Similarly, how much NO2 is produced via livestock eating leguminous plants - a 100% natural process, but it may still produce NO2 and so needs research on how to reduce that impact. Great article, thank you! Just missing the bit on BioChar, something that would turbocharge all these efforts, in combination with composting of course. Thanks for mention it (Biochar) here before me. The International Biochar Initiative, the Ithaka Institute, the Biochar Journal, Fachverband Pflanzenkohle, just to name a few credible information sources all work on the whole combination of responsible carbon - climate- employment- information sharing and education opportunities around the world. The Eco-Region Ökoregion Kaindorf in Austria and their Humus Akademie is providing first class practical transition methodologies. I just hope that in 2019 we will see the broader institutions and regulators come to realise and get behind it.